Great location. Security was excellent. The pillows were pretty much useless but the beds we're super comfortable. The staff wouldn't go out of their way like some other places I've stayed but if asked questions, they were very helpful. My biggest complaint was the wifi. Which barely ever worked. But I'm also not there to be on my phone. But it was hard to find time to book my next part of my trip just waiting for wifi to work long enough. Overall. Great experience. Great hostel with an awesome staff. Freddy is the nicest guy and extremely helpful. The location is a bit far from town compared to the other hostels but you can rent a bike for 24 hours for a fair price and also this hostel is right next to arguably the best beach in the area. The facilities are clean and overall very good but the rooms lack lock boxes. Best plus 1 for this hostel is the amazing free breakfast. I definitely recommend 506! 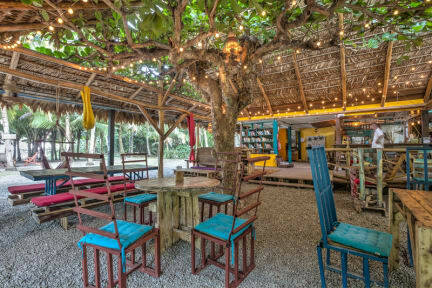 About 2 km from Puerto Viejo is this amazing place! If you are looking for a nice place to relax this is the place! It is located at the beach!! The kitchen facilities are good, the staff and dogs are nice and helpful. Spent 4 nights here in a dorm, with curtains around the bed to make more personal space. The gates close at 10- and only access with a key, which makes it pretty safe! I will definitely recommend playa 506! Located on a really nice beach a bit out of town. Bit pricey for what you get (I.e no aircon in the dorm). Short bike ride to town and you can rent bikes off them. Food is good but a little pricey but probably similar to the rest of Costa Rica. Free breakfast was really substantial! Would stay again. DON’T STAY HERE! During our stay the water was only functional for two hours a day 7:00am-8:00am and 7:00pm-8:00pm - we were not provided advance notice of this situation. The hostel explained that they were being punished by the government for failing to have rain collection units. The hostel itself is nice, until you’ve stayed long enough to recognize the horrible infestation of large mice. When we brought this up to the staff they were rude and seemingly unsurprised. Pick another place!